Ajusted brightness/contrast, hue saturation, color levels, and cropped. Nice angle and perspective, but a little flat in lighting. That's a very cute cat. 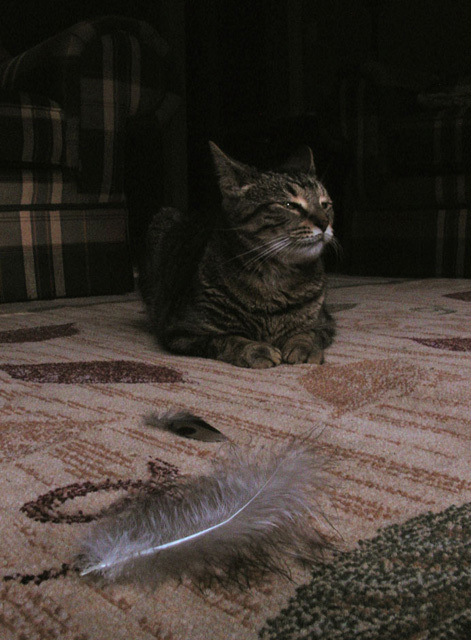 Is the feather really the result of her misbehavior? Nice idea, was that bird half-peacock, and half-... More visible cat would be better, with more lighting, eye-contact, bigger, less distracting background. Hope others catch the idea. Cute idea! I like the look on the cat's face. A little dark .. not much great shot love the title. This is a tough one. I'm not really getting the connection. Sorry. As for the image, it's composed ok, but seems a bit too dark. Excellent expression, perspective and focus! Proudly hosted by Sargasso Networks. Current Server Time: 04/18/2019 05:07:50 PM EDT.